Felt can be cut to size, machined to your specifications, provided in sheets, or stripped to width. 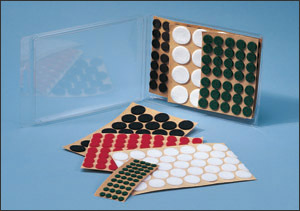 Adhesive backing can be provided. Paramount Polishing Products: Polish faster and easier with an expanded line of Paramount products-wheels, ring buffs, bobs, brushes, and muslin buffs. Drumbeaters: The same excellence in Piano Felt production is provided by Bacon Felt for custom Timpani. Steel Felt: From raw felt fiber to the finished product, Bacon Felt designs for cold mill rolling, hot rolling mills, annealing and coil resets. Felt Dots: Adhesive Backed Dots 1/4 inch to 1 inch diameter in a variety of colors.